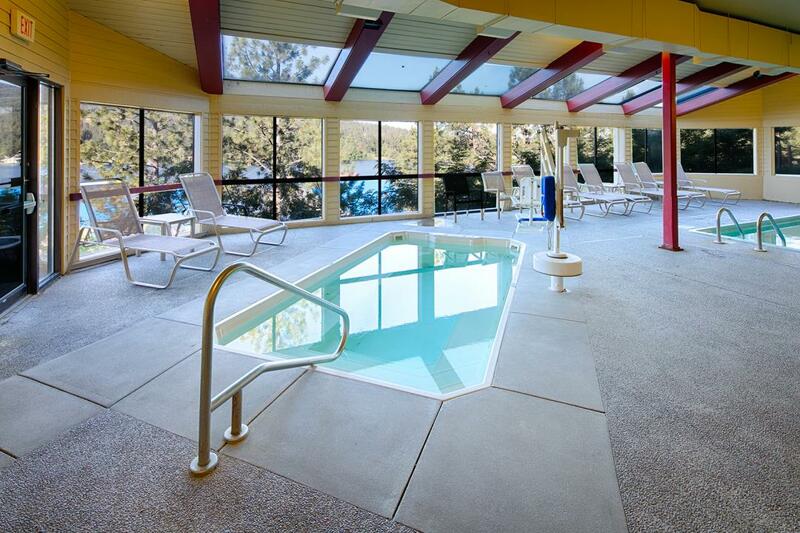 Comfortable luxury meets outdoor adventures at Red Lion Templin's Hotel on the River in Post Falls, ID where guests can enjoy a premium hotel near Spokane located in the heart of the outdoors. Tucked away in the majestic mountains of Post Falls, Idaho, Red Lion Templin's Hotel on the River is nestled on the Spokane River in Northern Idaho, just 35 minutes from Spokane International Airport. 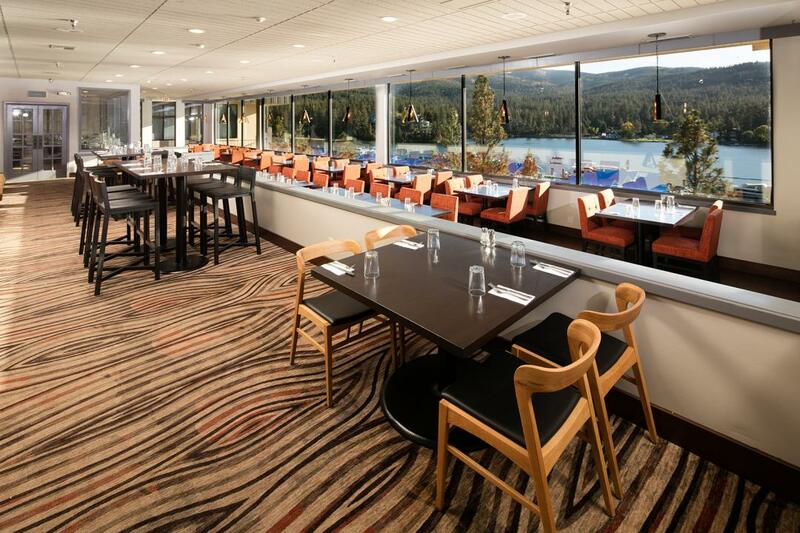 Our hotel offers a convenient location near some of the area's most sought-after attractions in North Idaho, including Coeur d'Alene restaurants, entertainment, and more. Take advantage of our fitness center, indoor pool, tennis and volleyball courts, and other amenities before heading to our private beach and taking in picturesque river views before returning to our on-site dining destination, Mallards Restaurant, for sumptuous menu choices. Mallards Lounge features flat-screen televisions for your favorite sports or entertainment. With over 11,000 square feet of meeting space in north Idaho and full-service catering, Red Lion Templin's Hotel on the River, one of the most highly-regarded hotels in Post Falls, Idaho, is an ideal retreat setting for corporate meetings, team building retreats, family reunions, and other social celebrations. Whether you're traveling for business or leisure, you'll discover the warmest hospitality at Red Lion and the best of Post Falls at our hotel. We look forward to welcoming you and providing an idyllic choice of accommodations in Idaho. A chosen destination among hotels in Post Falls, Red Lion Templin's Hotel on the River offers everything you need for work or play. Whether you're looking to have a productive workout in our fully-equipped fitness center, need to get business done in our expansive meeting space or are looking to relax in the soothing waters of our indoor pool or private beach just steps from the hotel, you'll enjoy your stay at Red Lion. 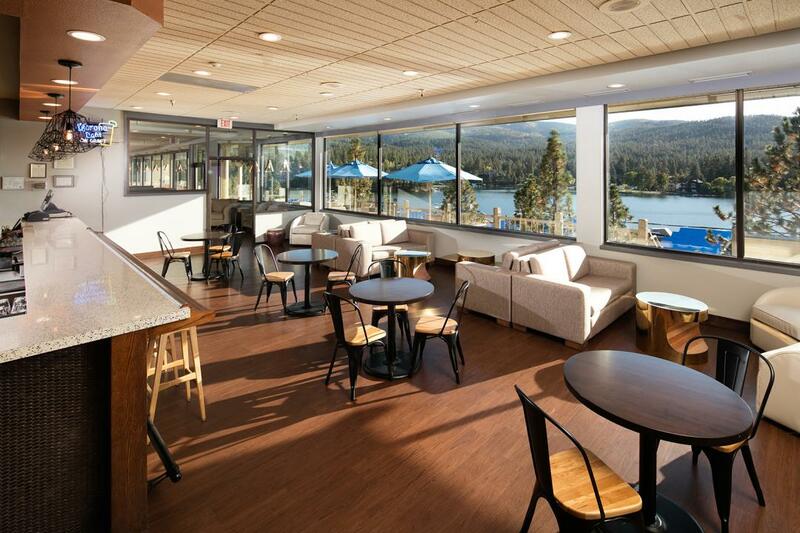 In addition to a breathtaking location overlooking Templin's Post Falls Marina and the Spokane River, we pride ourselves on offering modern amenities and unparalleled service that you won't find at other Post Falls hotels. Start the day with a signature breakfast at our on-site dining destinations or visit one of our favorite restaurants throughout the day to discover the best meals in Idaho before retreating to your comfortable guest room. Savor BBQ on the beach at Post Falls, ID with Red Lion Templin's Hotel on the River. Enjoy sun-filled fun all summer long and indulge on our decadent dining in Post Falls, ID. At Templin's River Grill you can enjoy live music and a huckleberry barbecue buffet every Thursday evening from 5:00 pm - 9:00 pm, June through Labor Day. Please your palate with one of the best experiences available at restaurants in Post Falls, ID just moments from your door, while soaking in the vibrant atmosphere that surrounds the hotel. A great way to experience Post Falls outdoor activities, Red Lion Templin's on the River offers complimentary bike rentals. 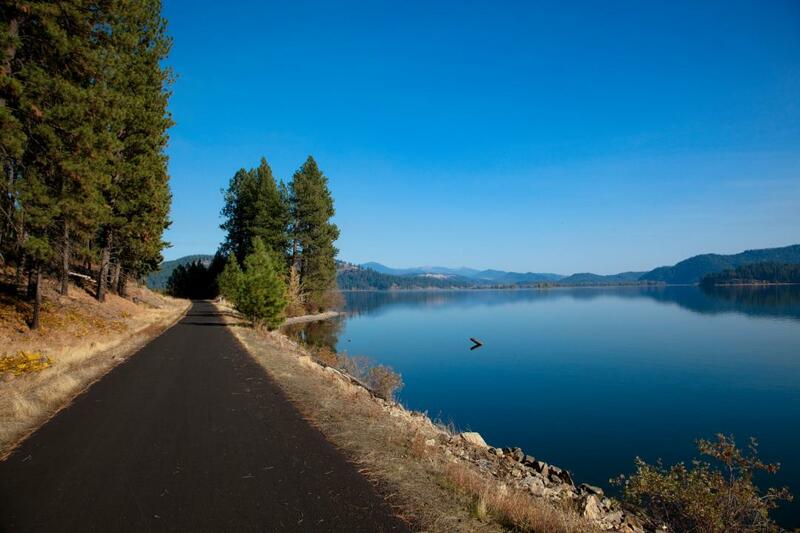 Located on the waterfront, our hotel is the perfect place to start your tour of Post Falls or Coeur d'Alene on one of our complimentary bicycles. Take the Columbia Plateau Trail to see Ice Harbor Dam or peddle the John Wayne Pioneer Trail—the longest rail-trail conversion in the United States—spanning over 250 miles. 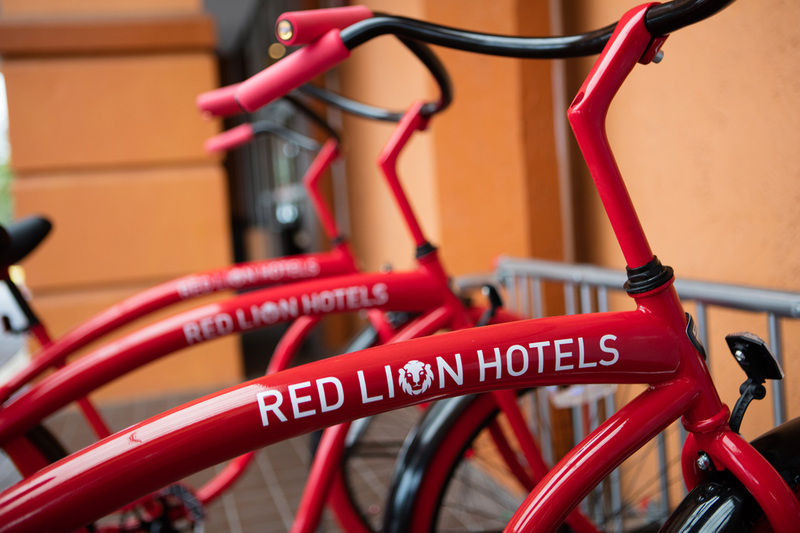 If an urban spin is more your speed, Red Lion Hotel Templin's on the River - Post Falls is only minutes from Coeur d'Alene. Take advantage of our hotel near Templin's Marina, where you'll have access to waterfront views, boating, river floating, cruising, and entertainment. Whether you're looking for an outdoor adventure or want to sip a carefully-crafted cocktail while taking in stunning views, the marina offers opportunities for both. Templin's Marina offers professional marina services, 176 covered boat slips on the Spokane River in Post Falls, Idaho, just 8 miles from Lake Coeur d'Alene, 20 minutes by boat to Lake Couer d'Alene and has beach access for family fun on the shore. Slip amenities include individual covers, electrical connections, gas and pump out service and a marina shop and sundry store, so you can make the most out of your trip on the Spokane River. Looking for an adventure on the Spokane River? The Templin's Marina offers pontoon boat, paddle board, and kayak rentals. The Templin's Marina also has the only boat fuel available on the Spokane River. As the Templin's Marina hotel, the Red Lion Hotel on the River offers more than just an ideally situated location. We also feature a huckleberry barbeque buffet with live music every Thursday evening from 5:00 P.M. - 9:00 P.M taking place June through Labor Day. So what are you waiting for? 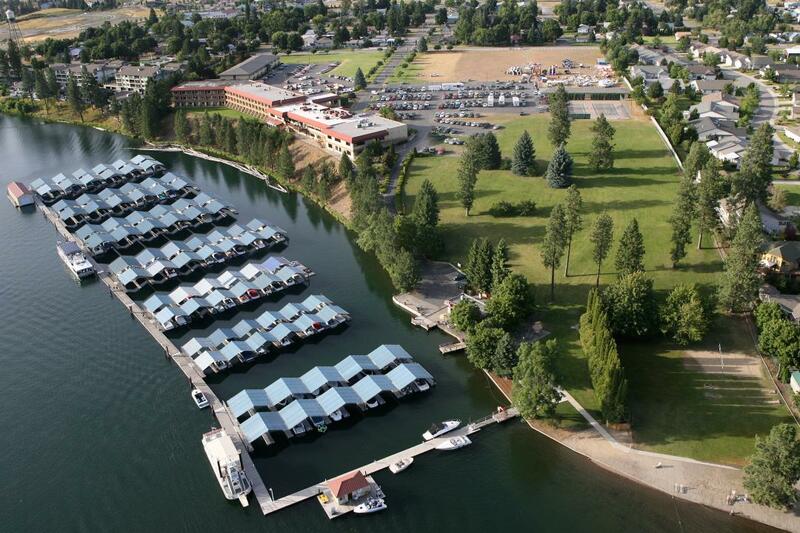 Visit our Post Falls hotel and explore the best of Templin's Marina and the surrounding area. It's no wonder that Red Lion Templin's Hotel on the River is home to the best dining in Post Falls, ID, offering carefully-crafted menu options in a picturesque setting. After a day full of exploring the area, enjoy a delightful meal among the idyllic Spokane River and take advantage of some of the best Post Falls restaurants including Mallards Restaurant and Templin's River Grill. A favorite among visitors and Post Falls locals alike, Mallards Restaurant is known for its classic American favorites and contemporary regional cuisine. Whether you're enjoying seasonal outdoor dining on the Flight Deck or the intimacy of a private booth, your group will enjoy panoramic views of the Spokane River. For fabulous cocktails, fine wines and casual dining, visit Mallard's Lounge. Offering an ideal atmosphere for romantic dinners and drinks with friends, the lounge offers a TV, stage, dance area and a view of the Spokane River. Open during the summer season for lunch and dinner, Templin's River Grill is a chosen destination of family-friendly restaurants in Post Falls that offers hamburgers, hot dogs, fish & chips, salads and ice cream treats. For great cocktails, fine wines, and casual dining visit Mallards Lounge in Post Falls, open daily. With river-view tables below and a lively seating area above, you’ll find the right atmosphere for any occasion from an intimate conversation to a fun time with friends. Our Post Falls bar and lounge also features a big screen television, stage, dance area, and pool table. A favorite of visitors and locals alike, Mallards Restaurant is a classic American restaurant in Post Falls, offering contemporary and regional cuisine. Come visit to enjoy seasonal outdoor dining on the Flight Deck or the intimate setting of a private booth for dinner, lunch or even breakfast in Post Falls. 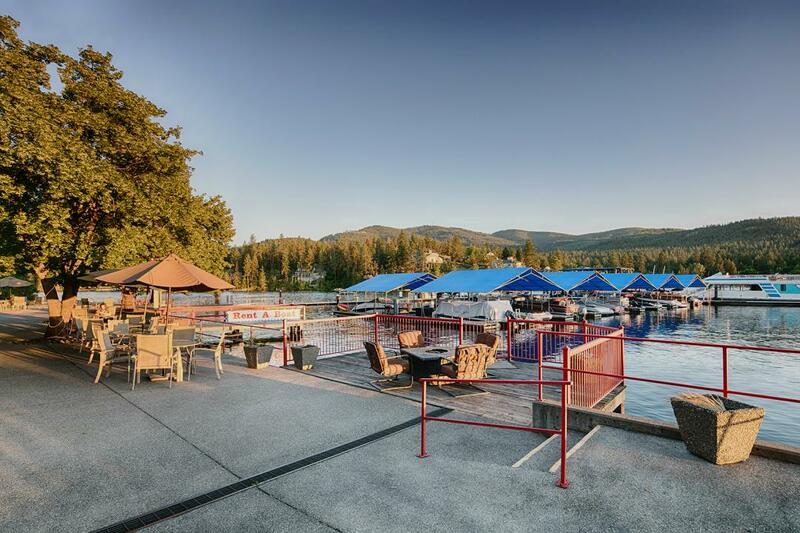 The whole family will enjoy the beautiful setting of this Post Falls restaurant with panoramic river views and pleasing prices. From A/V equipment to delicious full-service catering and flexible Post Falls meeting space spanning 11,000 square feet, Red Lion Templin's Hotel on the River is an ideal setting for social and business events. 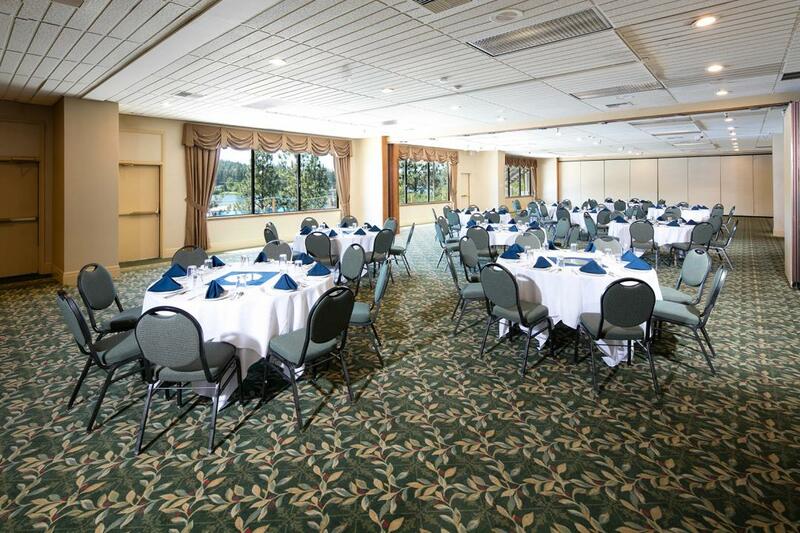 Whether you're looking to host an intimate cocktail party, a banquet or beach wedding, or a productive conference, our meeting space in Post Falls is sure to meet your needs. Enjoy premium amenities at our resort-style hotel and impress your guests or colleagues with unprecedented views of the Spokane River. As one of the most desirable Post Falls event venues featuring facilities that can seat up to 750 guests, Red Lion Templin's Hotel on the River is one of the best-equipped hotels in Post Falls, Idaho, with the creative vision and energy to ensure a truly unique event. In addition to a sophisticated backdrop in each of our ballrooms, Red Lion Templin's Hotel on the River is proud to offer delicious catering for your next event in Post Falls, ID. Our catering team has extensive experience in developing carefully-crafted menus from the freshest ingredients so you can impress your guests at your business meeting, conference, or wedding. From intimate luncheons to grand celebrations, we pride ourselves on offering signature meals that satisfy even the most discerning palate. Offering both finer dining options and family-style menus you're unlikely to find catering in Post Falls that provides an ideal dining experience. Our inspired menus and exceptional décor will ensure the success of your special event in Post Falls. For further assistance and to plan your event, please call (208) 773-1611 and ask for the catering director today. Red Lion Templin's Hotel on the River in Post Falls, ID recognizes the hard work that local, state, and federal government employees provide. As our way of saying thank you, our hotel is offering the per diem government traveler rate. Located on the waterfront, Red Lion Templin's Hotel on the River - Post Falls is an ideal location to rest and recharge. For the best government discounts on Post Falls hotels, look no further. Nestled into the mountains outside Post Falls, Idaho, our hotel is located on the Spokane River, just a ten-minute drive from Coeur d' Alene. With 163 well-appointed guest rooms, complete with plush mattresses, environmentally friendly products, a friendly staff, modern amenities, and on-site features like a fitness center, tennis courts, indoor pool, and more, Red Lion Templin's Hotel on the River is an ideal setting for your next retreat. Escape to the natural beauty of Idaho and enjoy the rest and relaxation that go along with endless mountain and river views. With over 11,000 square feet of meeting space able to accommodate up to 750 guests, you will find all the necessary amenities for hosting a seamless event your guests will fondly remember. With a location just 35 miles from Spokane International Airport, our retreat venue in Idaho is easily accessible, yet miles from the stresses of everyday life. Our helpful staff will take care of every need in order to ensure your retreat goes as planned, and your guests will quickly indulge in the restorative effects of our stunning location. With excellent dining options and seasonal entertainment options nearby, such as river cruises and pontoon boat rentals, Red Lion Templin's Hotel on the River has everything you need for a fun, productive, and relaxing retreat. Find your love and love your venue at Red Lion Templin's Hotel on the River offering an ideal setting for weddings in Post Falls, Idaho. Whether you're looking for a grand reception or a more intimate ceremony, our flexible and elegantly appointed spaces make for a romantic choice of wedding venues in Post Falls. Nestled among the brilliant mountains and featuring river views, our venues create a romantic space for a timeless occasion. What are you waiting for? Don't wait to start planning the wedding of your dreams in one of the most picturesque places to celebrate your love. Submit an RFP today to have one of our staff contact you to learn more about hosting weddings at Red Lion Templin's Hotel on the River. There's something for everyone in Post Falls, ID. From nationally-renowned golf courses, family-fun filled theme parks, world-class ski resorts, endless bike trails, and unparalleled shopping opportunities, you'll discover Red Lion Templin's Hotel on the River situated near the best Post Falls attractions. Unique shops, one-of-a-kind boutiques, and big brand name outlets are just some of the hallmarks of shopping in Post Falls, near Coeur d'Alene. When you stay at Red Lion Templin's Hotel on the River you'll awake to unparalleled views in one of the most convenient locations that are ideal for Post Falls and Northern Idaho shopping adventures. Take advantage of our special offers and visit Post Falls boutiques and shops at Cabela's with a $50 gift certificate. Soaring rides, plunging slides, and an abundance of fun await you at Silverwood Theme Park, one of the largest amusement parks in the Northwest. All the excitement is just around the corner from Red Lion Templin's Hotel on the River, located just 25 minutes from Silverwood Theme Park. Take advantage of your proximity to epic roller coasters, live entertainment, casual dining and desserts, and much more when you stay at our hotel near Silverwood. "We stayed two nights while visiting Silverwood which is only 30 minutes away. The staff was friendly and very helpful. We enjoyed the breakfast buffet and were delighted that our two teenagers ate for free (17 & under). The room was nice and the beds comfortable.We will definitely stay here again."